On Saturday July 27th 2013 we were at the Rocky Grove Firehall in Franklin Pennsylvania. 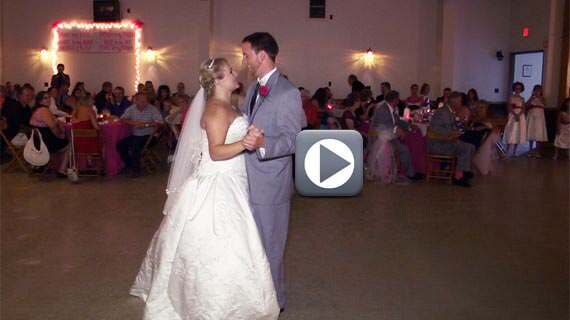 The event was a wedding reception for Tom and Chelsea Wolbert. Chelsea and Tom were married at 2:00 pm at St. Patrick’s Church in Franklin Pennsylvania. Guests began arriving at the Rocky Grove Firehall shortly before 3:30 pm where they enjoyed cocktails and appetizers as the bridal party posed for photographs with Betsy of Betsy Carroll Photography and video with Brian of Video by Design. At 4:45 pm we formally introduced the bridal party into the hall and then Chelsea and Tom shared in their first dance together as husband and wife to the song By Your Side by Sade. Next, the newlyweds cut their wedding cake prior to dinner. Dinner was prepared by the ladies auxiliary at the Rocky Grove Fire Hall and was served buffet style. After dinner, Chelsea danced with her father Mr. Jeff Mihleder and then Tom danced with his mother Mrs. Jeanne Wolbert prior to opening up the dance floor. Throughout the remainder of the evening guests danced to the sounds of DJ Pifemaster until the wedding reception ended at 11:00 pm.